Therefore, she seeks to show that, far from giving Christians reason to ignore calls for economic justice, this passage actually makes “one of the strongest statements of the biblical mandate to end poverty” (15). Reading Matthew 26:11 in this way may strike some as strange or odd. In part, this might be due to the unfortunate fact that Christian conversations about poverty in the Bible all-too-frequently fail to adequately include the voices of those actually experiencing poverty. Thankfully, Theoharis avoids this pitfall. She should be commended for intentionally giving space for the thoughts and ideas of poor people and grassroots antipoverty organizers to be heard (often in their own words), allowing their perspectives to help shape her development of an approach to reading Matthew 26:11 that allows the text to once again challenge, encourage, and inspire those working in their communities to end to poverty, rather than casting a shadow of indifference on their efforts (31-32). Theoharis develops her proposal by using empire-critical studies to reconsider the historical context of the passage and by engaging in literary analysis. For one thing, the location of Matthew 26:11 is important—it comes only a few paragraphs after the Last Judgment parable in Matthew 25, where Jesus states that when it comes to feeding the hungry, caring for the sick, and visiting those in prison, “just as you did it to the least of these who are members of my family, you did it to me” (v.40, NRSV). She—I think correctly—suggests that this in itself makes it less likely that Jesus’s words in Matthew 26:11 should be interpreted as a dismissal of God’s concern for those experiencing poverty. Theoharis also points out that Jesus’s response to the disciples in Matthew 26:11 alludes to Deuteronomy 15:1-11, which she thinks is significant since this Deuteronomy passage is “one of the most liberating ‘Jubilee’ passages in the Old Testament” (63). But which part of Deut. 15:4-11 is being referenced? For the purposes of Theoharis’s argument, this is an important question. Traditionally, it has often been understood to refer primarily to verse 11, but she believes the allusion also applies to the larger Deuteronomy passage as a whole, including verses 4-5: “There will, however, be no one in need among you, because the Lord is sure to bless you in the land… if only you will obey the Lord your God by diligently observing this entire commandment that I command you today” (NRSV). Basically, Theoharis is saying that Jesus’s allusion to Deut. 15 in Matthew 26:11 is best understood by remembering the larger context of the Deuteronomy passage, which emphasizes the need for obedience to God and the establishment of economic justice. In Always with Us?, Theoharis also delves into the socioeconomic realities of life for 1st century Jews living under Roman rule in order to dispel misperceptions of Jesus as a comfortable carpenter living a nice, middle class life. Most scholars agree that the vast majority of people during that period lived in serious poverty, with only a small number of inhabitants enjoying elite status (83). Theoharis’s sketch of economic life in Roman-occupied Palestine is vivid. She frequently incorporates the work of empire-criticism proponents like Richard Horsley to shed light on the economic hardships facing Jews living under Roman rule. While looking at these issues through an empire-critical lens undeniably helps readers gain a better understanding of the oppression experienced by many in Jesus’s day, there were a few points where Theoharis’s arguments seemed to lack nuance. For example, while scholars differ in their assessments of how the Jerusalem Temple was viewed by Jews in the 1st century (some think many felt a strong sense of allegiance to it while others think the Temple fell disfavor with the people because of corruption), Theoharis takes it as more or less as a given that the Temple establishment was resented for its wealth and corruption. That may well be true, but for readers not so familiar with the state of scholarship, it may have been beneficial if she had taken more time to familiarize them with the scholarly landscape, disputes and all. Nevertheless, her exploration of socioeconomic context persuasively demonstrates that Jesus and his early followers were poor themselves, which helps interpreters avoid harmful misunderstandings of Matthew 26:11. The unnamed woman in Matthew’s account of the anointing uses her expensive oil to anoint Jesus, rather than selling it for charitable purposes. This is seen by Theoharis as a critique of charity and patronage systems for dealing with poverty: “The woman’s action… subverts the whole system of buying and selling… She undermines patronage systems and charity rather than participating in them” (112). Did she actually have this intention in mind when she broke her alabaster jar and poured out its contents? Theoharis seems more certain of this than I am. Charity as a whole actually comes in for rather harsh criticism in Always with Us?, but I think I can understand why. Many Christians consider charity to be the only option available for bringing about the end poverty. Theoharis rightly reacts against this because, while charity is helpful on an individual level, it is an anemic strategy for dealing with more structural causes of poverty at a societal level. God’s call for justice goes beyond acts of mercy, but it doesn’t leave them behind. Liz Theoharis’s Always with Us? 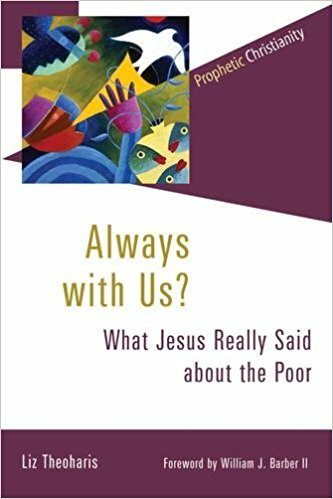 compels readers to re-examine one of the most widely known passages on poverty in Scripture, and in the process, she helps her audience recover an awareness of the socioeconomic difficulties that Jesus and his early followers faced. In my judgment, she successfully brushes aside many of the more harmful interpretations of Matthew 26:11, showing them to be implausible portrayals of the Messiah who did, after all, come to bring good news to the poor (Matthew 11:5). While there are some aspects of Theoharis’s proposal that I still have reservations about, I think it moves the interpretive conversation in a healthier direction. My hope is that this book will help Christians develop a richer imagination for what it might look like for God’s will to be more fully carried out “on earth as it is in heaven.” It’s a hopeful vision of an alternative kingdom that was needed then, is needed now, and will be gratefully embraced in the age to come. *Disclosure: A copy of this book was provided by Wm. B. Eerdmans Publishing Co. for review purposes. The opinions I have expressed are my own, and I was not required to write a positive review. This entry was posted in Book Reviews by joecrow91. Bookmark the permalink. You’re welcome. I’m glad that you found something to appreciate in it! Interesting to think about. Makes me realize how easy it is to read verses and just gloss over them. There’s much more to delve into and learn by thinking it through at a deeper level. Also your summer reading list looks very interesting – enjoy!